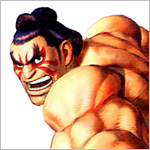 Honda is the only one of the original eight World Warrior's that did not appear in the Street Fighter EX series. Honda's Street Fighter II background stage makes a return in Marvel VS Capcom. To reveal the classic level, players must continue to bash their opponent through the right wall of the bath house stage.